Copyright: Comet images: ESA/Rosetta/NavCam–CC BY–SA IGO 3.0; VIRTIS images and data: ESA/Rosetta/VIRTIS/INAF-IAPS, Rome/OBS DE PARIS-LESIA/DLR; G. Filacchione et al (2016). 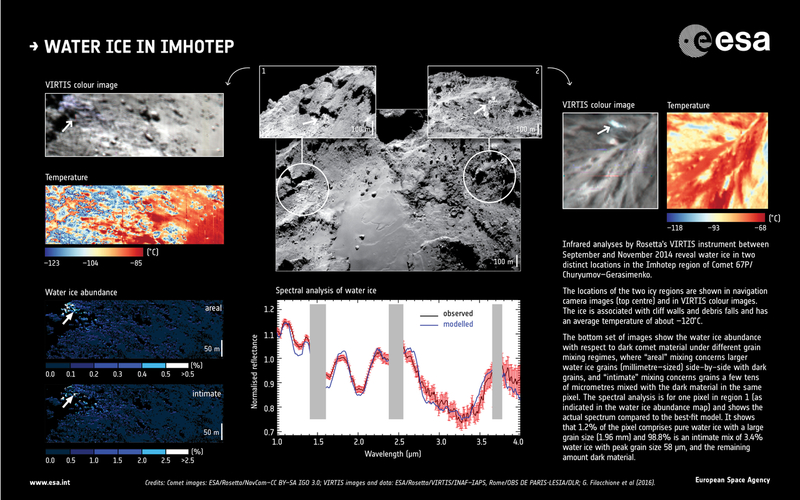 Data collected by Rosetta's Visible and Infrared Thermal Imaging Spectrometer (VIRTIS) between September and November 2014 provide definitive evidence of water ice in the Imhotep region on Comet 67P/Churyumov–Gerasimenko. The locations of the two icy regions, spanning a few tens of metres across, are shown in navigation camera images and in VIRTIS colour images. The ice is associated with cliff walls and debris falls and has an average temperature of about -120°C. The bottom set of images shows the water-ice abundance with respect to dark comet material under different grain mixing regimes, where "areal" mixing concerns larger water-ice grains (millimetre-sized) side-by-side with dark grains, and "intimate" mixing concerns grains a few tens of micrometres mixed with the dark material in the same pixel. The spectral analysis shown in the centre of the graphic is for one pixel in region 1 (labelled with the arrow in the abundance map) and shows the actual spectrum (with error bars) compared to the best-fit model. It shows that 1.2% of the pixel comprises pure water ice with a large grain size (1.96 mm) and 98.8% is an intimate mix of 3.4% water ice with peak grain size 58 microns, and the remaining amount dark material.